Naturally, I always try and recreate my restaurant faves at home so that I can enjoy them and make them even more guilt-free by being completely in control of what's going into them. These lettuce wraps were no different. My dad had tried his hand many many years back now at making lettuce wraps. His were good. Really good. But, man... they were such an ordeal to make. So. Much. Chopping. It was one of those task driven recipes that, by the time you were done, you weren't even hungry anymore. You know what I mean? This version is much more simple and honestly, I think tastes even better. (Sorry, not sorry!) Don't tell him that though. So, that's what I used to base these lettuce wraps off of. Usually, these lettuce wraps are made with ground chicken but I'm opting for ground turkey today instead since it's my typical ground meat of choice. 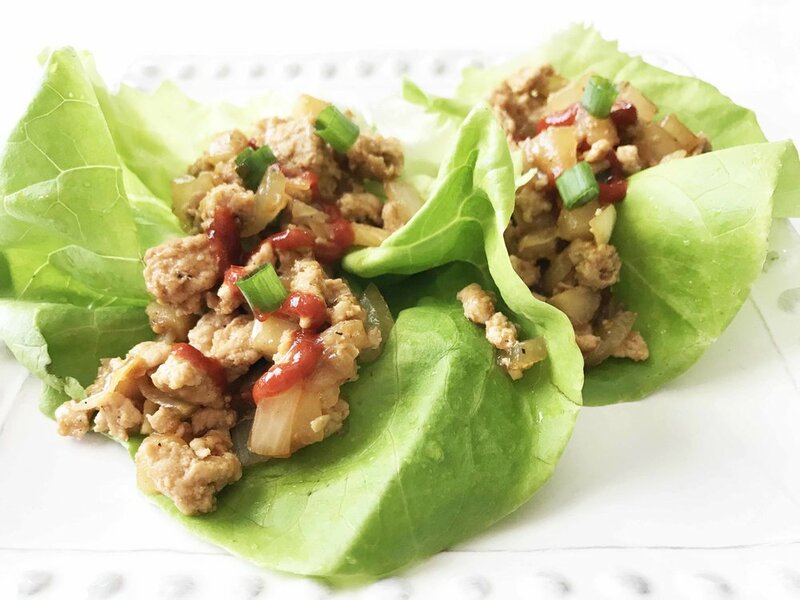 I will warn you that these Healthified Turkey Lettuce Wraps are addictive. The whole plate can disappear in a matter of minutes. They also have a decent kick of spice, so if you have a delicate mouth (or kids eating these) you may want to avoid the Sriracha. There you have it! The perfect take-out cake-out. It's a perfect meal for meal prepping or even as a make ahead dinner. The filling reheats beautifully for a quick and easy weeknight meal! Easily make them gluten-free by using a gluten-free soy sauce or coconut aminos, and by using a gluten-free hoisin sauce too. A lightened up version of a pupular asian restaurant staple. It's quick and easy to make, plus they are absolutely delicious! This take-out fake-out is even better than the ones you can order. Heat the 1 Tbsp. Extra Virgin Olive Oil in a large skillet over medium-high heat. Place the 1 Lb. Extra Lean Ground Turkey into the skillet and cook until browned. Stir in the 1 Chopped Onion, 1/4 C. Hoisin Sauce, 2 Tbsp. Reduced Sodium Soy Sauce, 1 Tbsp. Rice Wine Vinegar, 1 Tbsp. Freshly Grated Ginger, 1 Tbsp. Sriracha, 1 (8 Oz.) Can Diced Water Chestnuts, and 2 Green Onions. Cook until the onions are tender and translucent. Add in the 8 Oz. of drained Water Chestnuts and cook for another couple of minutes. Season with salt and pepper to taste and remove from the heat. Serve right away and enjoy with additional green onions or sriracha! I like to serve these family-style; piled on a big plate with a side of the butter lettuce.